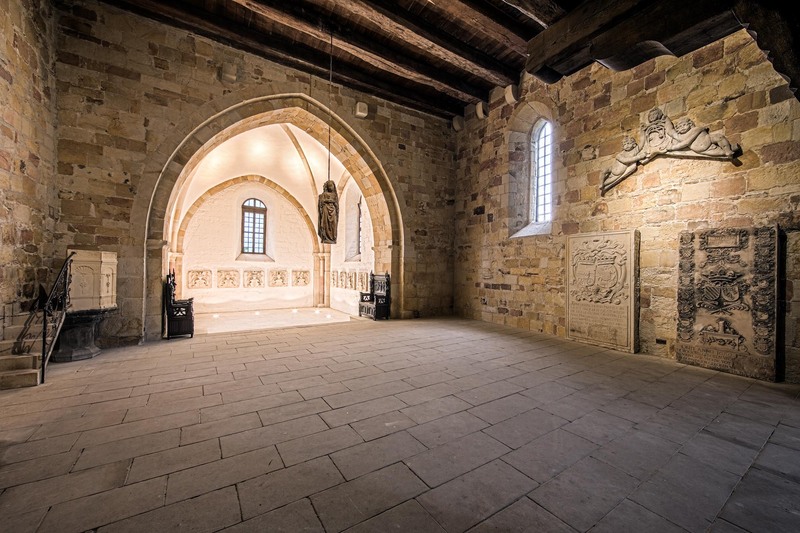 St. Catherine's Church is an unadorned Gothic Church room with a rustic timber ceiling and a large gallery. Interestingly enough, the choir, which extends into the Romanesque Bingel Tower, lies a few steps lower. On the walls there are tombstone slabs and hatchments as well as the ancestral charts of Eberwin III (1536 – 1562). Deserving particular mention are the small pulpit and the double-sided Gothic sculpture of the Madonna, done by Master Evert van Roden of Münster. Besides Heinrich Brabender, this artist was one of the most important Westphalian sculptors working around AD 1500. The figure, hanging freely in space, each side showing the Madonna from the front, their backs touching, was originally made for Cloister Frenswegen in 1503. The polychromy of the sculpture was removed during restoration work. In 1588, Count Arnold II converted to Calvinism, which rejected any forms of pictorial decoration. The room, with its roughly hewn timber ceiling and large gallery, displays the kind of simple elegance that is characteristic of reformed churches.